Mathematics is a subject that most children find difficult to grasp. Language learning comes easier with kids and the analytical and logical areas of their brains develop at a much later stage. Therefore, many primary and beginner schools apply many techniques to help small children understand the basic rules of mathematics much easily that through reading books and writing in notebooks. Mathematics at a daily level requires a person to solve practical problems mentally without using any gadget. Getting used to solving mathematical problems in a calculator hampers that skill. So, it is advisable that children are taught the method of mental problem solving using an abacus to handle real life mathematical issues easily and more successfully. The mechanism that works in a basic abacus model is that simple mathematics is being taught through the muscle coordination of both the brain and the hands. Children as they play with the beads arranging them symmetrically on their abacus stands get a better idea of the number system. The arrangement of the places and digits helps them calculate the mathematical problems using logic and visual application. Using an abacus helps children visualize a number and not just see it as a set of digits. The abacus method of mathematical learning helps the two hemispheres of the brain to work together and thus, produce an accurate result easily. Using the abacus system has a major advantage over the other digital systems like computers and calculators as the production cost of the entire procedure is very low when compared to its counterparts. Also it encourages children not to take the help of external objects and apply their own brain and sharpens the calculative powers as they count and logically deduct each problem. The abacus is said to have originated thousands of years back. The first extensive use of the abacus for deducting mathematical problems was done by the Chinese. It was done as an improvement over the simpler counting boards of the time. Abacus (Brain Master) has been used extensively in most Asian school since the very beginning stages. It is already a known fact that the visual impact of any object is much more than the theoretical impact of the same. The concept is much more common in kids who find it extremely difficult to comprehend mathematical problems and acquiring good skills in mathematics. It is therefore, a very good idea to help small kids understand mathematics through simple practical problems which they see in everyday life and can easily grasp. Many researchers have shown that children coming from Asian countries like Korea and Japan have shown much better mathematical skills than those of their western counterparts. This is due to the early application of the Abacus (Brain master) methods in their schools. Using an abacus develops the analytical skills in children and helps them use their brains much more than other kids who use calculators and computers. 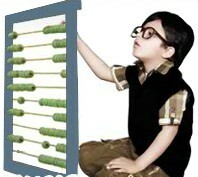 Using abacus is also a great way of developing the vertical and horizontal orientation in children. Counting numbers in places and whole units has been made extremely easy using an abacus.